To illustrate this Christmas period, I searched among my photos to find something seasonal: a combination of green and red, for example, to remind us of the holly branches with their red berries. I show you green throughout the year, with all those fields of tea, but red is much harder to come by. 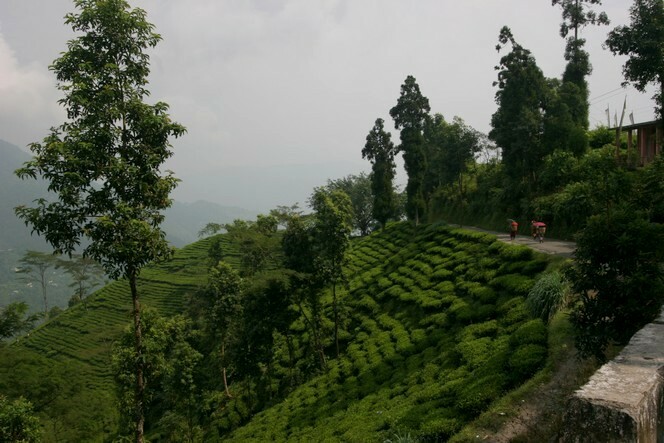 Take a good look at this little winding path near Teesta Bazar (India) and you will spot three tea pluckers beneath their red parasol. They are like you, they have just done their shopping and are returning home, having a good chat on the way.